There you go, yet another image about jotas. This time I've got the musicians. Men dressed as baturros (the link is in Spanish I know. 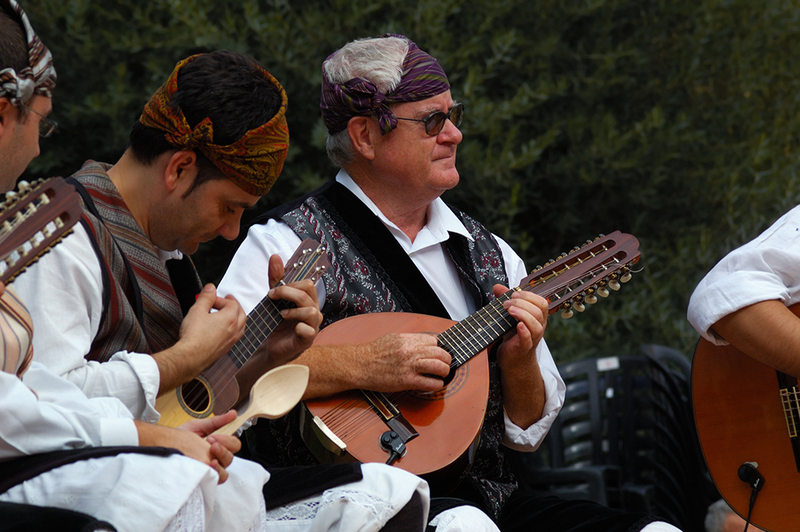 It refers to the different nuances of the word in our language, some good and some bad) a term that refers to peasants from Aragon playing traditional instruments like this Bandurria (Mandurria). Remember this group was part of Festa Major celebrations at Torre Llobeta square in Nou Barris, Barcelona. There are many Barcelona inhabitants coming from different regions of Spain, so I found it more than adequate to show them in Barcelona Photoblog. Qué serie de fotos más chula, más expresiva, más colorista y más todo. We like the look of concentration in their face! And what is it with the spoon? It is an instrument too? I suppose so. It is funny, I saw the spoon but I didn't wonder what it could be for. Thanks for that observation. About the link, I am sorry I couldn't find a similar text in Spanish. I think it is too specific. But considering I have some Spanish visitors too, I finally took that liberty. Thanks for the comment and the nice words about the language.